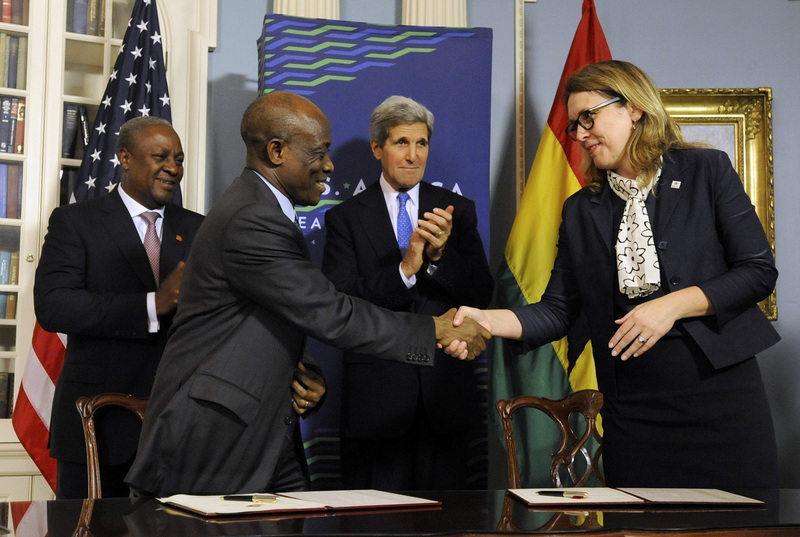 Ghana President John Dramani Mahama and U.S. Secretary of State John Kerry applaud as Seth Terkper, Ghana's Minister of Finance and Economic Planning and MCC CEO Dana J. Hyde shake hands after signing of the Ghana Power Compact on Aug. 5, 2014. Part of the compact was devoted to policy reform in the energy sector. President Obama’s trip to sub-Saharan Africa later this month—his fourth since he took office—underscores the commitment the U.S. government has made to the region. Over the last decade and a half, we have invested billions of dollars to help some of the world’s least privileged people escape poverty. MCC has played a big role, investing roughly $6.5 billion, or 65 percent of our portfolio, in Africa. But it’s not just about the dollar amount. It’s about what we’re doing to help build the foundation for long-term sustainable growth. And one way to catalyze growth is to encourage good governance—from combatting corruption to reforming industry regulations. We talked a lot about this at the Third International Conference on Financing for Development this week, where mobilizing the private sector was central to our discussions. The Conference on Financing for Development is also where MCC was conceived back in 2002, and now 13 years later, we were proud to be a major contributor this time around. At MCC, promoting good governance is baked into everything we do, from country selection to project implementation. Before we commit a single dollar, partner countries have to show that they are committed to ruling justly, supporting economic freedoms, and investing in their people by passing key indicators on our scorecard. This provides a powerful incentive for reform and it also means that we only work with relatively well-governed countries. Take Ghana. While per capita income is only $1,620, Ghana has performed extraordinarily well on our scorecard–scoring at or near the top of its peers in categories like political rights, civil liberties, control of corruption and gender in the economy. That gave us the green light to partner with Ghana, and since 2006, MCC has committed roughly $1 billion to help reduce poverty there. We also focus heavily on the policy environment to help drive sustainable growth and enable other private investment. So when we joined forces through the U.S. government’s Power Africa effort in Ghana with a new compact last year focused exclusively on energy, we devoted part of our work to governance reform. Overall, we committed $498 million to strengthen the performance and financial viability of the utility company, improve regulatory monitoring including a review of the tariff system and build core public infrastructure to reduce losses in the system and increase access to more customers. Policy reform combined with institutional strengthening and public infrastructure has resulted in private sector commitments of an estimated $4.6 billion. Our country partners and the private sector tell me that MCC’s ability to leverage systemic reforms is as important–if not more important–than the dollars we bring to the table. Because while the dollars go away after five years, the policy reforms endure. It’s clear that good governance is critical to development, and MCC—along with our U.S. government partners—will continue to encourage a commitment to good governance and smart policies in our partner countries.